It's a cliche to say, but the Outsiders truly are back and better than ever. Outsiders: The Good Fight, the fifth volume of Judd Winick's Outsiders series, reintroduces the team after jumping a year forward in time as part of DC Comic's "One Year Later" event. With this trade, writer Judd Winick returns to the premise of Outsiders, a team of rogue heroes taking a proactive stance against villains, and the premise works better and feels more natural than it did even when the series started. With The Good Fight, Winick has cut a lot of dead weight from The Outsiders, and what's left is more interesting by far. The Outsiders team began from the ashes of the Titans, at times a sidekick support group, when the Titan Donna Troy died. 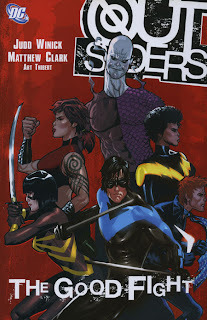 Though Titans Nightwing and Arsenal formed the Outsiders to create a team without emotional bonds, the characters often second-guessed themselves because of Troy's death. With Troy returned to life, the Outsiders now have at their core only their mission of hunting bad guys, and serves to make the stories both more focused and more fun. The new Outsiders shrinks a sometimes large cast down to just six heroes, allowing for greater focus on the individual members. Nightwing returns in the lead after leaving the team, and Katana, a member of an earlier incarnation of Outsiders, works as his second-in-command. The villain Captain Boomerang appears after the year-long break working with the heroes; that his father killed the father of the current Robin will undoubtedly be addressed. Winick's creations Grace and Thunder are back, and Thunder seems as different--sporting a new costume and more confident attitude--as Grace seems unchanged, at least until we learn the two have started a relationship, and Grace may not be entirely human. And Metamorpho joins the team, replacing his shape-changing clone Shift, as Winick drops hints that Shift may have been responsible for a crime during the missing year. These characters are far more genuinely "outsiders" than the original team, and their quirky nature only adds to the book's appeal. Winick portrays the Outsiders as a team truly willing to bend the rules in order to get results, a goal professed but nevcer achieved by teams like Extreme Justice and the former Outsiders incarnation. Over the course of The Good Fight, the Outsiders both overthrow a dictator and blow up a nuclear reactor, gaining the attention of both the Checkmate spy organization and Superman himself. The scene where Nightwing threatens Superman with a box of kryptonite that everyone believes is fake, but turns out to be real, is especially effective. Outsiders: The Good Fight is a true black ops superhero drama, the likes of which only barely seen before in Joe Kelly's excellent Justice League Elite, and I'm eager for the next volume. My sincere hope is that Winick can keep up this same tone and pace as the series continues. More One Year Later trade reviews on the way!